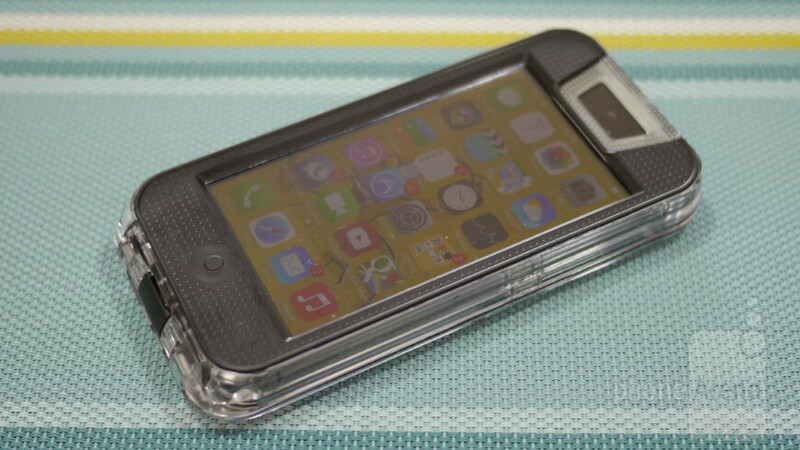 The name Outdoor Tech is enough to make people think about tech products made for the great outdoors, so when it comes to cases and whatnot, it doesn’t surprise is that the Outdoor Tech Safe 5 case for the iPhone 5 is waterproof. Taking a dip in water shouldn’t be an issue with this one, as its IPX-7 rating ensures that it’ll be safely protected when it’s submerged in up to 3 feet of water for 30 minutes. One unique thing that jumps at us right from the start is its translucent shell, allowing us to see the entire phone from within the case. It’s different from other waterproof cases we’ve seen, but in order to maintain its waterproof nature, we’re required to lock all three of the aluminum quarter-turn latches in the rear of the case. Although it ensures that the rubber gasket running around the interior is safely sealed to prevent water from gushing in, it’s just annoying that we have to constantly remind ourselves to carry along a coin with us, since it’s futile using our fingernails to unlock/lock the quarter-turn latches. The clear translucent casing is no doubt different, but at the same time, its plastic construction means that it’s not the kind of case that’s meant to be dropped a whole lot. Indeed, the phone is still safely protected from minor falls, but it’ll incur some scruffs and deep scratches in the process – making the case look badly beaten up over time. Visually, the overall design is a bit subdued, due to the bulkiness of the case and its bland aesthetics. Fortunately, the volume controls and power buttons are easily accessible, thanks to the raised rubber nubs placed over them. Strangle though, there’s a lot of gap between the plastic screen cover of the case and iPhone’s display – requiring us to deliver more pressure with our presses & swipes. Sporting a retail price of $49.95 and available in three different fun colors (clear, aqua, & orange), the price doesn’t really scream at us – more so when it’s only a waterproof case, as opposed to also being impact resistant. 55, lost my intrest some time ago and I haven't played it actually for a while. Hopely some day it drops to that pipe and teleports back to 8-bit Super Mario world. I got 46 at the day I downloaded the game, 82 in the next day. For me the difficulty of the game is average. But now I've lost interest of flappy bird, 'cause it's too boring. Why doesn't anybody made case to iPhone with 3310 structure/design? Same time retro and Chuck Norris-proof. It would sell like hotcakes. It's only water-resistant, not waterproof.